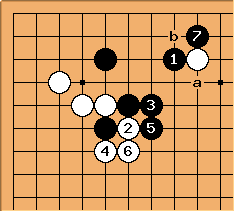 Alex: Twice in one night at the Go club, both as White in two-stone handicap games, I made a low approach to komoku (shown here with the colours reversed), had the two-space high pincer played against me, jumped out to and, instead of the response at a I was expecting, was faced with the aggressive answer at , which I hadn't seen before. 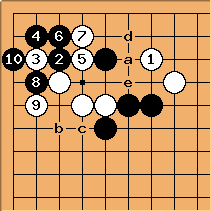 From here, the obvious line of play is to W0, after which White b and Black c are honte. 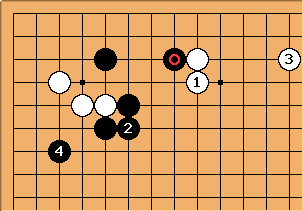 However, I had the suspicion (correct, it turns out) that both of my opponents were imitating something they'd seen in a high dan KGS game and, it being a handicap game, wanted to get them out of a memorised pattern and into unfamiliar territory where they would actually need to think a bit. Patrick Taylor: Did you mean in the paragraph above? "W0" doesn't appear in the diagram, for that matter neither does . Alex: My sneaky move was at here. The ladder was good for Black, incidentally, so the cut at a wouldn't work, but that probably wouldn't be the best play even if the cut did work. Alex: What I was hoping for was for White to try hitting the shape point immediately with . This lets Black attach in the corner at and make a staircase with . 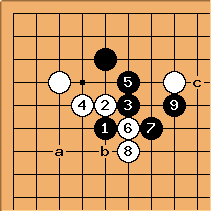 White can't play at a (read this out for yourself), so with the sequence up to , Black has something resembling eyeshape in the corner, access to the centre, and White can't defend both sides at once. 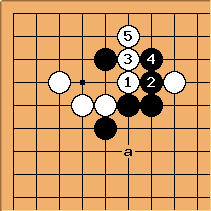 Black has succeeded in starting a fight, which it what he wanted (since Black is actually White in this handicap game). Alex: Cutting with is straightforward. 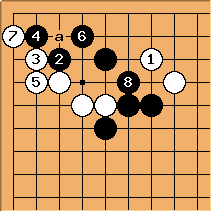 Black gives up the corner with - in return for outward influence. This is what I was expecting as worst-case scenario, and it isn't really all that bad. White gets a lot of territory, but I like thickness, and was planning on playing the honte move at a next if White (that is, Black in the game) followed this line. 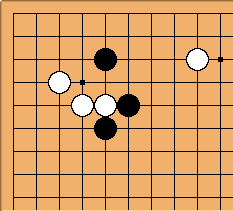 In the first actual game, White played , but then played at , which is obviously bad. Maybe I'll add a diagram for that later, but I'm short of time at the moment. Alex: I think it would also be just fine to play like this. Black's attachment at a is no longer so great, since the staircase doesn't work after , so fixing his shape with becomes urgent. White can make the rather thick hane at next. White gets a slightly better deal, but Black ends in sente and there are large endgame moves in the corner, which tend to go in the stronger player's favour in handicap games, so I could have accepted this result. 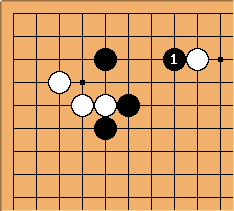 In the second actual game, White played at b, which is bad because it doesn't prevent the staircase in the corner from working. I attached at a, White tried to resist the staircase and ended up with a disaster. tderz: might be a thank-you move as is a powerful center move. 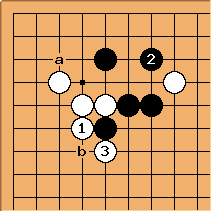 Alex: I thought about this, but the problem I had with it is that Black now has two vital shape points left unplayed - d and e and, since both are pure gote for Black and each carries a big follow-up for White, he will get to play at most one of them. Alex: Anyone have anything to add to this analysis? It's actually quite an interesting noseki, I think. 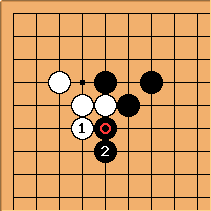 I decided to put it down as a hamete/trick play, since I think it ends up slightly favourable to White with the correct answers and slightly favourable for Black if White makes the "obvious" move (taking the shape point immediately). Bill: What if White cuts Black's corner off with - ? Alex: Yes, of course. Typical of me, overlooking the obvious in favour of a bunch of strange variations. It still gets a little tricky after - , because both a and b look, at first glance, like decent continuations for Black, and White can't prevent both. However, in reality only b is a significant threat. 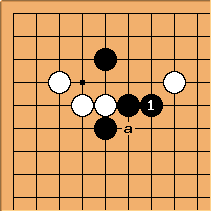 If White cuts off Black's lone stone with e and connects her groups, Black can peep at b, then play c and get a decent result. 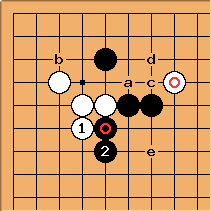 However, after W c, B a, as long as White just connects under with d (Black doesn't have enough liberties to do anything about this) and doesn't try to cut with e, White definitely has a very good result, having developed on both sides, while Black's group is left very weak and his corner is only about 5 points. tderz: Yi Changho played . White could stretch at a or hane at b.
tderz: ... and White extends-kakaris at a.